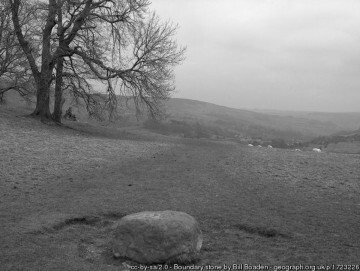 The Boundary Stone acted as a marker separating the residents of the plague affected village of Eyam from the non-affected villagers of Stoney Middleton in 1665. It is here during the plague that money soaked in vinegar (believed to kill the infection) was placed by the villagers of Eyam in exchange for food and medical supplies. The village of Eyam has become popularly known as the Plague Village, a fact that has made it one of the most visited and well know village’s in the Peak District, for it has a fascinating yet tragic story to tell. In August 1665 the bubonic plague arrived at the house of the village tailor George Viccars, via a parcel of cloth from London. The cloth was damp and was hung out in front of the fire to dry, releasing the plague infested fleas, claiming George as the first plague victim who died of a raging fever on 7th September 1665.
here that their closest neighbour, Stoney Middleton, just a short stroll across an open field joins the story. 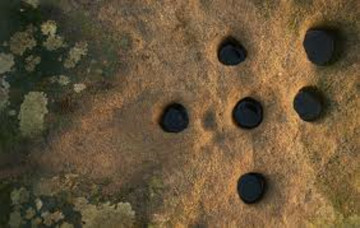 To minimize cross infection, food and other supplies were left at the Boundary Stone which was situated midway between the villages. The stone had 6 holes drilled into its surface where money left as payment was left in vinegar soaked holes, believed to kill the infection. The Plague in Eyam raged for 14 months and claimed the lives of at least 260 villagers. By 1st November 1666 it had run its course and claimed its last victim. Eyam’s selfless villagers, with their strong Christian convictions, had shown immense personal courage and self-sacrifice. They had prevented the plague from spreading to other parishes, but many paid the ultimate price for their commitment. Almost 350 years later a remembrance service is still held every Plague Sunday at Cucklett Delf, on the edge of the village. Cucklett Delf also represents a story of heartbreak concerning Emmott Sydall and Rowland Torre. Emmott was a young girl of about twenty two who was betrothed to Rowland Torre from Stoney Middleton. Emmott lived in a cottage across from Mary Cooper’s house where the Plague started. Her father John Syddall and four of her siblings were among the first victims of the disease. At first Rowland would visit Emmott in the village, but when they realised this was too dangerous, the lovers would arrange to meet secretly but at a distance minimalizing any risk of Rowland catching the disease. It is suggested that the two would only have looked at each other from a distance, and in silence, lest their plan should be discovered. When Emmott stopped appearing towards the end of April 1666, Rowland continued to go to their meeting place, with hope that against all odds, she might still show up. He was one of the first people to re-enter the village when it was pronounced safe towards the end of 1666, but was soon told the worst; Emmott Syddall had died in the April.